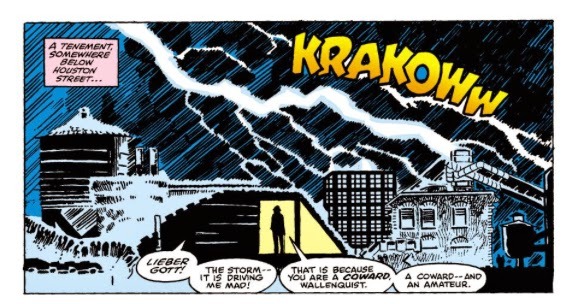 When Frank Miller took over art duties on Daredevil #158 in the late 1970s, working off of scripts from Roger McKenzie, his work was electric. People took notice immediately. But Daredevil was a struggling book and had been for years at that point, and an up-and-coming young artist couldn't turn same-old, same-old stories around. Nearly two years later, however, Miller took over scripting duties. 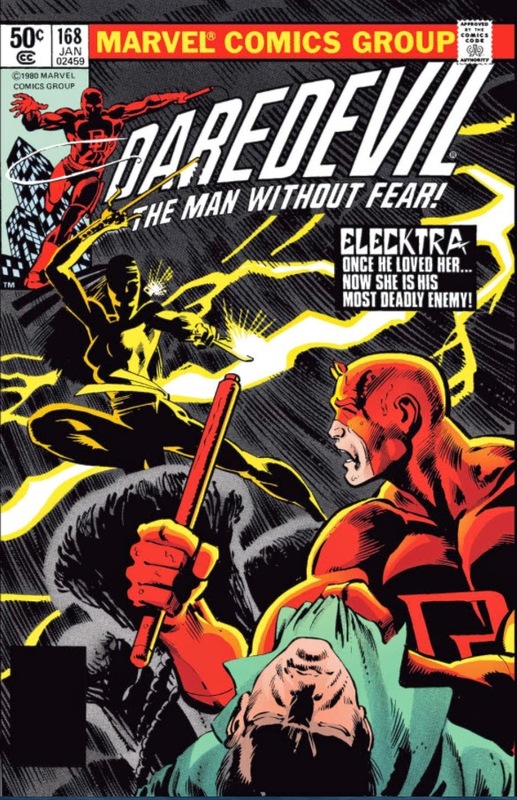 In Daredevil #168, "Elektra," he teamed up with Klaus Janson on inks (and transitioning to pencils) and with Denny O'Neil as editor, and together they turned the title around almost instantly. Within just a few months, the series went from a struggling also-ran in Marvel's catalog to one of the must-read titles of the 1980s. Daredevil #168, Miller's first issue as writer, follows Matt Murdock as he competes with a mysterious bounty hunter to track down a murderer trying to flee the country. The story is simple, but it's mostly a vehicle for Miller to introduce a new character to the series: Elektra Natchios, Matt Murdock's long-lost college lover turned deadly bounty hunter. The middle of the issue is an extended flashback to their courtship, showing how they met in college and began dating in secret, before Elektra's father's tragic death - the first of many 'Daredevil watched helplessly while someone fell to their death' moments in Miller's work - tore them apart. With Elektra back in the picture, however, Daredevil is forced to confront not only the mob-protected murderer, but his long-lost love herself. Though it's hard to imagine now, Elektra was reportedly intended to be merely a one-off villain, with little by way of long-term plans for her character. But part of serialized storytelling - perhaps the most exciting part - is knowing how to improvise. Elektra would become a recurring character over the course of the next year, until her death in what has become Miller's most famous Daredevil story. Miller has been so crazy and self-indulgent for so long, it's easy to forget how talented he was when he burst on the scene. Daredevil #168 is quick, crisp, and impeccably structured, avoiding many of the pitfalls the issue would almost certainly have if it came out today. In some ways, it's actually a strength that Miller had few plans for Elektra at the time. Because of this, he is forced to not only fit all the major beats of their relationship into a single story, he's forced to give it some dramatic closure by the end of the issue. So the issue doesn't just introduce Elektra; it gives her a full-fledged origin story and a basic dramatic arc, a template for future stories that would prove enticing both to audiences and to Miller himself. And while Miller's work - and Daredevil as a book in general - has a reputation for being mired in grim thematic content and violence against women, nothing could be further from the truth with the beginning of Miller's run. After Elektra knocks out Daredevil early in the issue, despite not yet knowing his identity, she bandages him up, making sure he's okay. I don't even think Miller's heroes would be doing anymore in just a couple short years, but here, Elektra is a moral person in an immoral business. The issue as a whole is a pretty nakedly emotional story about two young lovers torn apart, and then reunited as adults who no longer see eye-to-eye, a tragedy that would only deepen over the next year of stories between the two. In many ways, it is the sociopathic virgin/whore Elektra of Daredevil: The Man Without Fear, Miller's 1993 retelling of Daredevil's origins, that is his most well-remembered take on the character. Indeed, I wouldn't be shocked if the upcoming Netflix Daredevil show pulled heavily from The Man Without Fear (and the Loeb/Sale Daredevil Yellow) for its inspiration, although Elektra herself will not be in the series this season. The latter Miller story is simply too good a fit for modern TV, telling a single story broken up over six issues about a bleak, tormented anti-hero skirting the edge of darkness for them to avoid it. But I believe that Miller's earlier work on the character is a vital reminder that Daredevil doesn't have to be dark, doesn't have to wallow. The best Daredevil stories are rarely great, grim crime sagas; rather, his most enduring stories tend to be melodramas amped up to nigh-operatic levels. While it eventually descends into the paranoid, conservative ramblings Miller would one day be known for - The Man Without Fear basically recasts Elektra as a Sin City character - this is still a major breakthrough work from one of the most important comic writers of the 1980s. But even beyond that, it has a sense of sympathy that Miller's later work was often lacking. Bullseye, Elektra, and Kingpin are clearly villains, but they're characters first and foremost, and tragic ones at that. Daredevil's relationships under Miller's pen tend to have bleak outcomes, yes, but they're also warm and humanistic. Regardless of what Miller planned or intended, regardless of what eventually became of the writer, Daredevil #168 is an excellent introduction to all the qualities that would make Daredevil shine - and continue to influence creators more than three decades later. - Starts with Miller's time illustrating the character, unfortunately, but it does dive into the beginning of his run as a writer by the end of the volume. - Yet another of Miller's iconic Daredevil stories, this one heavily featuring Kingpin and Karen Page. That said, I'd be shocked if much was pulled from it for this first season of Daredevil. - Another probably inspiration on the Netflix series, albeit less so, this rewrites Daredevil's origin to better set-up the Elektra story. I'd skip it, but it has plenty of defenders.